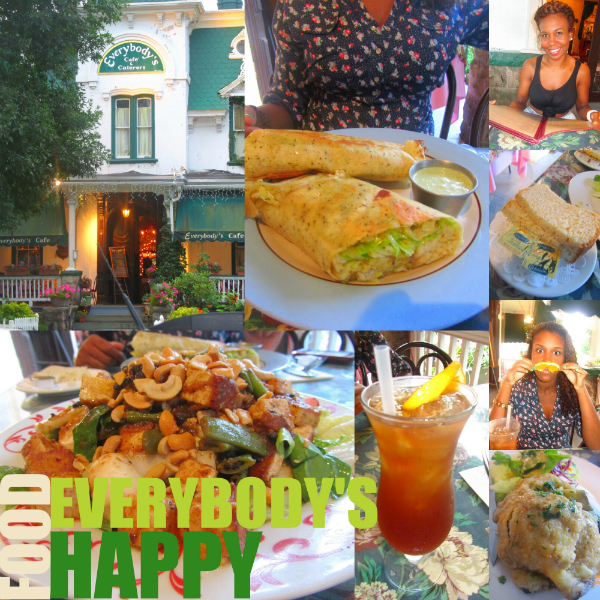 I have very fond memories of Everybody’s Café. As a teenager I used to work here during the summers to earn extra money. One thing I will never forget is the very large menu (over 150 items) as well as tasting amazing food for the very first time. I remember being excited when the owner slid me a piece of Tiramisu or trying the black bean and tofu salad for the very first time (when I was a carnivore) and I couldn’t believe it tasted so yummy. Well recently my sister and I went back to see if this old favorite still had its charm, and let me just say it did not disappoint. The thing that that is so amazing about this place is it has something for Everybody, hence the name. The vegetarian and vegan menu have over 50 items alone and that is enough for one restaurant. It does not stop there they have a complete pescatarian menu, as well as beef, lamb, and poultry menu. There is literally something there for EVERYBODY! My sister and I started out with two homemade herbal black current ice teas. Then we shared the eggplant and spinach roulade, the flavors were savory and amazing. For our entrée’s my sister got the scallop wrap and I had to stick with my old favorite the black bean and tofu salad. This salad is made by searing the tofu in a garlic sauce, the greens are marinated in a ginger sesame vinaigrette and its topped off with sautéed black beans and loads of peanuts all the flavors combined are AMAZING. I will be recreating some of their menu items in the coming months. Till then enjoy the pictures.